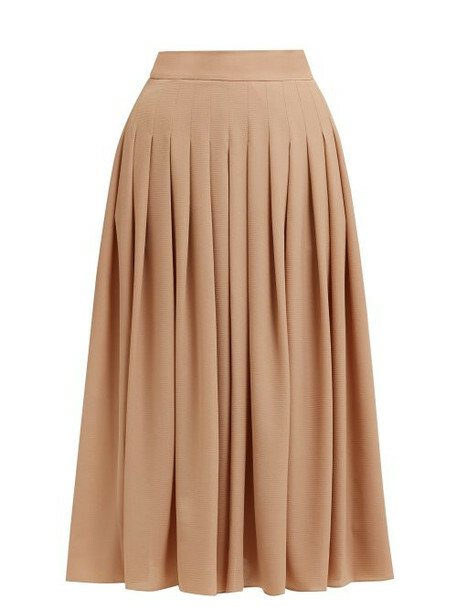 Emilia Wickstead - This brown Fred King crepe midi skirt was first styled as part of the fifth look in Emilia Wickstead's SS19 runway show, offering a stylish introduction into the season's new muted mood. It's crafted with a high-rise waist and long inverted knife pleats that travel down from coordinating topstitching for a streamlined finish. Style it with a cream blouse and neutral-hue pumps for a ladylike occasion edit.